Apple's Grand Central Terminal Retail Store to Be Largest Yet? 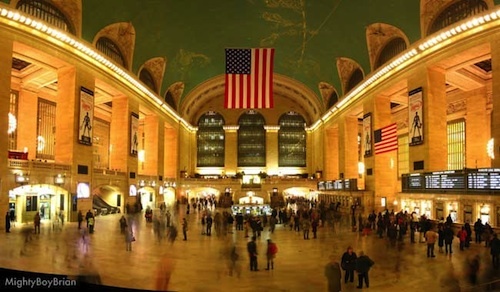 Last week, a pair of reports surfaced indicating that Apple is hoping to build a new retail store inside Manhattan's busy and historic Grand Central Terminal. Located less than a mile from the company's flagship Fifth Avenue store, the Grand Central Terminal location is reportedly being viewed as a means to ease the massive customer load on the landmark, but relatively small, Fifth Avenue store. A new report issued today by Cult of Mac provides additional claims of an Apple retail store coming to Grand Central Terminal, but goes on to claim that the location would offer the company's biggest-yet retail sales floor, larger than those found in the company's Regent Street and Covent Garden stores in London. While reports of the square footage for Apple's various locations have always been subject to significant variations, the Covent Garden location has been said to offer over 16,000 square feet of publicly-accessible space (with 40,000 square feet of total space including corporate offices) and Regent Square location is said to offer 25,000 square feet of retail space. Consequently, Apple's Grand Central Terminal store would appear to have to be in the range of 25,000 square feet to qualify as the company's largest, making it a significant presence inside the terminal. The store will open in the fall, likely early September - and it will be Apple's largest retail space in the world. The store already has a name: Apple Store, Grand Central, according to a source close the company. The source said Apple will be making an internal announcement within the next month or so. "The company will certainly pull out all the stops on this one," said the source, who asked not to be named. An early fall opening seems rather ambitious for what seems to be a massive project with historical implications and lease issues that do not appear to have been worked out yet, but the growing number of reports do suggest that Apple is looking at making a significant splash in the terminal. Update: A look at the Grand Central Terminal leasing plan (PDF) shows few options for an Apple retail store of the rumored size, although Apple could attempt to combine spaces, even over multiple floors where possible, to put together a retail space. And as mentioned in the earlier report from The New York Observer, selection of tenants for Grand Central Terminal is an open public process involving requests for proposals, casting some doubt on just how far along any such plans from Apple could be, given the absence of any word from Grand Central Terminal management.